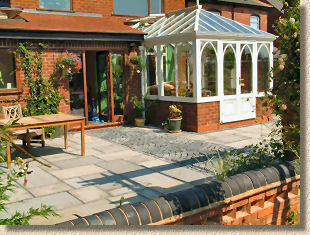 Mick O'Callaghan completed his patio project in the Spring of 2005. "The circle give me a real bad time. 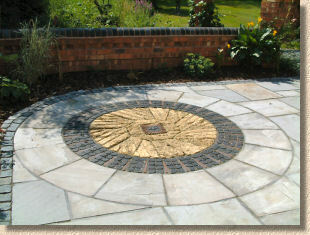 I saw a patio circle design in a old Stonemarket catalogue that I liked but I wanted to do it in Indian sandstone. I don't know if you have seen it - it's the one with a French millstone surrounded with a circle of engineering bricks and then a outer circle of slabs. 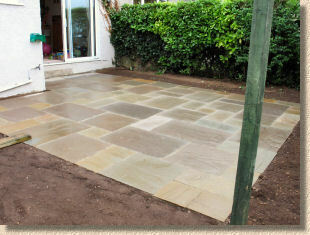 I bought the French millstone and one outer circle slab, then used the outer slab as a template to mark the Sandstone slabs and cut them with a borrowed still saw. I then roughed the edges off with a bolster to make them look hand cut. Then I laid the inner millstone, put a pin in the middle and using a bit of wire laid the outer circle. Then I put down the rest of the patio." "I intended to then put the ring of engineers in but to my horror the gap between the outer ring and inner millstone was about two inches to big. The solution was to go down the local reclamation yard to find something that would fit. What I found was those blue bricks you can see. I think they are stable paviours but are not sure. (Tony: They're known as Chocolate Block Pavers) When they were laid the joints between them looked to big so I put a bit of roof tile between to break it up. 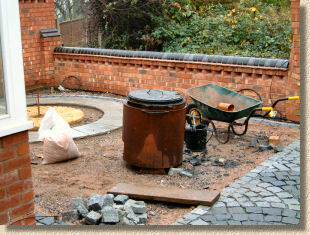 The centre bit of the Stonemarket millstone looked nasty so it was replaced with half a blue brick and some more tile. It took me ages but in the end it turned out better than the original plan." 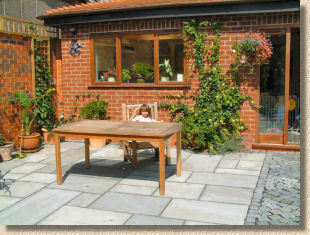 "The pergola was also inspired by your web site and is looking better now the plants are growing up it. I don't know if you remember but you gave me some help via your forum when I was having trouble with pitch sticking to the setts. Thanks again for all your help and an excellent website that I keep re-visiting. 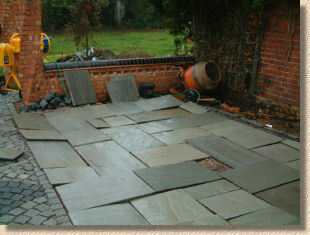 A couple of images from Adrian Bright showing the patio of Rajpur Green sandstone completed in early summer of 2005, despite the weather! 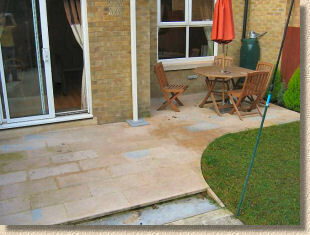 "Sometime back in April 2005 I started to lay a patio, with the excellent advice that you had given on your site. I eventually got it done then pretty much forgot that I said that I'd post some pictures of it. I've dug around the Brew Cabin forum and found my original topic to refresh your memory. Well, I finally managed to get myself a new digi-camera and take a few pictures of the finished article. It's been finished for months now so it's lost some of its initial sparkle and it's weathering in nicely at the moment. These pictures were taken without any 'tarting-up' or cleaning of the patio, just exactly as it was as of 9:00 this morning when I left for work. It comes up a treat if I get outside with a stiff brush just after it's rained. If you don't mind I'll attach a few pictures on here as you seemed interested, even though I'm sure you see patios every day and this is nothing spectacular to say the least. 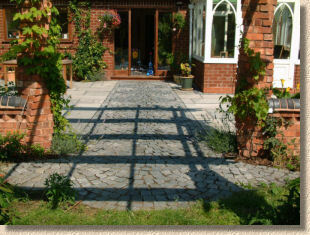 If you want to include them on your web site in the DIY Section then please feel free." 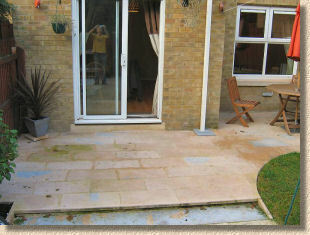 "The first photo (on the left above) is showing the finished article, here you can see the patio as a whole (missing some on the left hand side). As you can see I've put in a step to make it different than just a flat area, and this also shows the curve that I included just to stop everything looking so square. 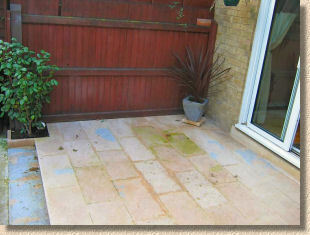 The photo on the right above shows the left hand side of my patio. As you can see it's not the cleanest at the moment! Here you can see that I've also included another 'feature' by building in a little planting area. This obviously didn't need to be here but I thought that it added something a little different, and personally I think that it's turned out pretty well. 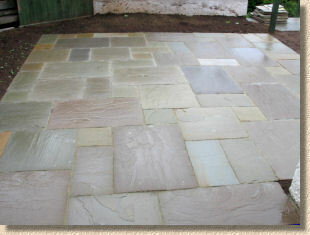 The slight blue/grey areas on some slabs are not spillage of something, it's actually part of the stone." "Above left shows the little planting area in more detail (unfortunately I forgot to move my little lad's ball from behind the plant). 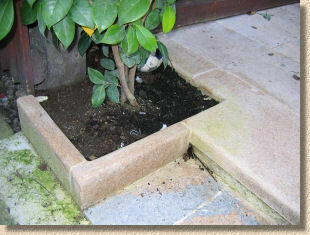 Here you can see the step, and how I made the area. 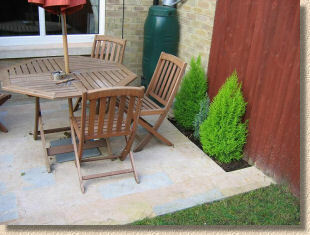 I think that you can see that I've rounded off the sharp edges of both the step front and around the planting area. It was initially done purely for cosmetic reasons, but it's also better incase my little boy trips over and bangs his head on the edge. "Above right is the right hand side in slightly more detail. I've also included a little area here and popped a few little conifers in, just to brighten it up a little and stop it from looking so hard." Click for larger image "Again, a general picture of the patio showing most of it, and also unwittingly a reflection of myself taking the picture! Obviously I won't be giving up my day job to become a photographer, or even a builder/patio layer for that matter. Just noticed on this picture that I'd not mentioned that on the right hand side of the step I've included a little triangle section just to pull everything together and make it 'balance' and as the grass slopes up slightly it gives it a cleaner finish, sometimes I feel it's the little things that make a big difference. It would have been easy not to put it there and leave it open but a 5 minute job of cutting and securing makes a big difference." "That's the lot. I've got a few more that I took on an old (35mm film) camera that I've yet to get developed showing what it looked like before, and during, but I've not yet got them developed and scanned in. Believe me though when I say that it's a massive improvement! It used to be a fair bit smaller with the big old council looking slabs and a mixture of other random slabs that the previous owners seemed to just randomly throw down. As soon as we bought the house it was one of the first things that I wanted to get changed. I'm pleased with it anyway. Thanks very much to you and your website for helping me all through the process as I've never ever attempted to do anything like this before. I've even got my 'falls' correct wich was one of the most satisfying part of the first rainfall watching it gently roll towards the step and grass, and not having any puddles laying around afterwards.